Sony VAIO Duo 13 SVD13215PXB Black 13.3" Ultrabook is a capable, fast and versatile laptop and tablet (two in one).. With a 4th generation Intel Core i7- 4500U processor, 8GB Ram memory, Full HD 1920 x 1080 touchscreen LCD and a all-new, TRILUMINOS Display for Mobile technology. 4th generation i7 processor in this Sony Vaio is fast!.. I ran Adobe Photoshop and Dreamweaver on it a few times without problems. Computer is up and running in a couple of seconds from sleep mode, it starts in 10 seconds and restarts in 20 seconds. SSD (Solid State Drive) technology in this Sony Vaio doesn't include any moving parts, so you get a more durable laptop and tablet that is less prone to physical damage. Battery life is longer than most other computers and recharges pretty quickly. It gave me roughly 9.5 hours before dying in my first try. Battery also doesn't drain in sleep mode, so you can leave it in sleep mode than shutting it down. I quite like that sliding screen design lets the screen be closer to my fingers and keyboard than other laptops. The machine overall does look good- has a very sleek design that allows you to move easily between laptop and tablet modes. It weighs only about 2.93lbs as it is made of carbon fiber that is very light and thin. This laptop is very light! But still feels solid and durable. Keyboard is not big but the keys are very well placed so I was able to type quickly with minimal errors. LED keyboard backlight that frames and illuminates the keys is a nice feature when you are typing in dim light, so it is easy to find the right keys. It has a good quality webcam and a FastAccess Facial Recognition application to log in. It is fast in recognizing my face, which is great. 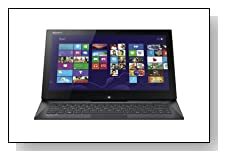 Fan is not noisy and you can adjust the noise along with CPU performance in Sony Vaio Control Center. The digitizer stylus feature is really good in this model as it allows you to tap, write and draw without too much effort. It recognizes the lightest pressure and lets you adjust your brush size and weight quickly by pressing softer or harder. IPS (in-plane switching) technology allows you to have nice and clear images from different angles. Triluminos display on Full HD 1920 x 1080 screen gives you natural colors, clear images and cool graphics. Conclusion: I quite like the convertible Sony VAIO Duo SVD13215PXB 13.3" model. Although it is not the cheapest ultrabook around, you get what you pay for. It is pretty to look at, powerful, fast, solid, thin and light and offers tablet and laptop in one, long lasting battery, beautiful multi-touch IPS screen and graphics as well.